I grew up eating a lot of sauerkraut. My favorite is probably sauerkraut with apples and pork chops, although I also love to saute some and serve it on my beer boiled, then grilled brats. However, it’s one thing I was always a little hesitant to make myself. My mom would make it in a huge vat in the basement. Here in Florida, I have neither a huge vat nor a basement. Luckily, I’ve found a much more manageable recipe that only requires a stock pot or food-grade 5 gallon bucket. Sauerkraut is made using fermentation as a preservation method. Fermentation makes foods more digestible and adds beneficial enzymes and probiotics to the food. Fermented foods are known to help digestive issues and improve overall health. Some of these benefits are lost when foods like sauerkraut are heat processed during canning. 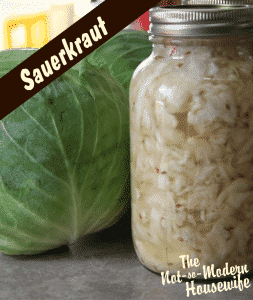 The best way to get the maximum benefits from sauerkraut is to make it yourself. Here in Florida, cabbage is currently in abundance. I can buy it at the farmer’s market for $1 for a large head. Since the only other ingredients are pickling salt and caraway seed, that makes this a very inexpensive recipe. I got 3 1/2 quarts of sauerkraut from 3 heads of cabbage. Thinly slice the cabbage or shred it in the food processor. Gradually pack the cabbage into your container, adding salt and caraway seed as you go. Press the cabbage down with your fist as you add it. The pickling salt draws water out of the cabbage and creates a brine for it to ferment in. Pressing down the cabbage as you go will get the maximum amount of water out of the cabbage and help ensure the cabbage becomes submerged. Once all of the cabbage has been added to the pot, place the plate or lid on the cabbage. Set the gallon jug of water on top of the cover. This will compress the cabbage and keep it submerged in the brine while it ferments. Press down on the plate every couple hours for the first 24 hours (obviously you don't have to do this overnight, you are allowed to sleep). By the end of the 24 hours, the whole cover should be submerged. If it is not submerged, add some more salt water (1 tsp salt to 1 c water). Find a dark, cool place to keep the pot for the next 4 weeks. I put mine in one of my lower kitchen cabinets. You may want to cover it with a cloth or pillowcase to keep out dust, pet hair and flies. If you're using a 5 gallon bucket, don't put the lid on. Just like sourdough, sauerkraut draws in microorganisms from the air to help develop its flavor and gain additional health benefits. Sauerkraut can be fermented in jars and I know a lot of folks who prefer it that way. I prefer wild fermentation. I think it gives it a more complex flavor and it's the more traditional way of making sauerkraut. Check it every other day to skim gunk off of the top. There will be some mold growth. This ok. Just spoon it off. Clean off the jug and cover, then replace. Add more salt water if necessary to submerge the cover. It's important that the sauerkraut stays submerged. This will keep oxygen from reaching the cabbage and making it go bad. At the end of 4 weeks, the sauerkraut is ready to eat. You can either keep the sauerkraut in the pot or pack it into jars. Since I only own one stock pot, I elected to pack it into jars. If you don't already own a Mason jar funnel, I suggest you get one. It will make the whole process much easier. It's almost impossible to get the sauerkraut into the jars without one. 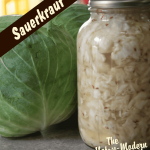 The sauerkraut does not need to be refrigerated, but it will continue to ferment. Refrigeration will slow down the process. For now, my jars are residing on my kitchen counter. I'll move them to the fridge once I have more room. Now you have me craving a Reuben. This would make the perfect recipe to add to my pastrami! Yum!